Another beautiful day: mild temperatures, blue skies, moderate wind, reasonable road surfaces. 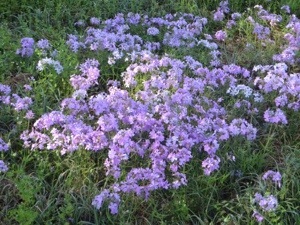 But as Donna and I biked today, we agreed that the surroundings were not as beautiful as yesterday or Tuesday. 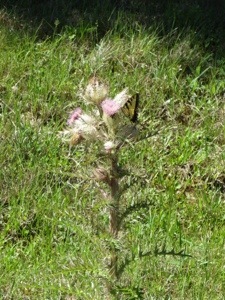 We did like these flowers along the road, and enjoyed the butterfly eating from the thistle. 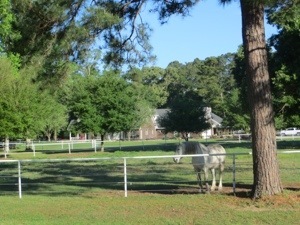 We did love this house, and stopped to feed the horse an apple I had in my back pack. 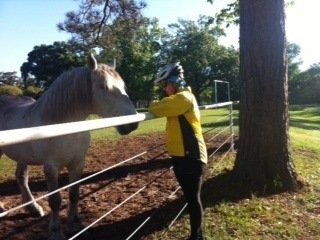 The horse and I became friends, and afterwards he wandered over to another horse inside the fence to brag about the treat. My right hip was bothering me early on, so at the first SAG, Carla, our driver for the day and a physical therapist back home in Brazil, gave me a nice stretch and massage. 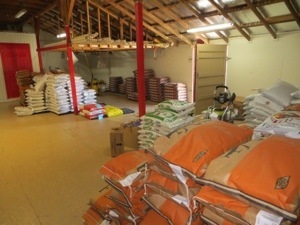 I was good for the rest of the day. 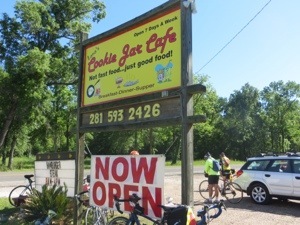 When we saw bikes lined up, we stopped at Lona’s Cookie Jar for coffee/soda and a delicious chocolate chip cookie. 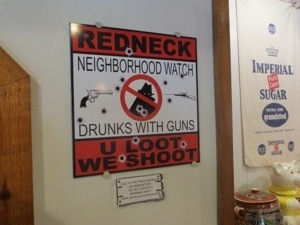 Check out this sign posted inside the shop. 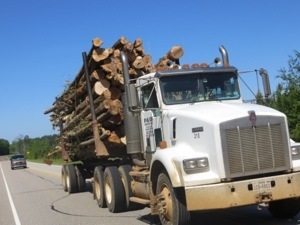 We had been warned about logging trucks, and we saw many, but they gave us wide berths. 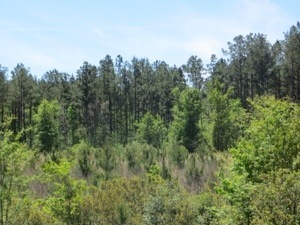 You can also see the remnants of cuttings, and some new trees that have been planted. 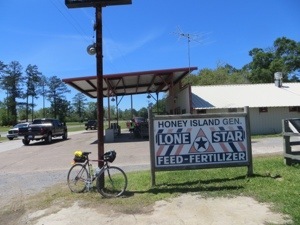 At mile 46, we stopped for lunch in Honey Island. 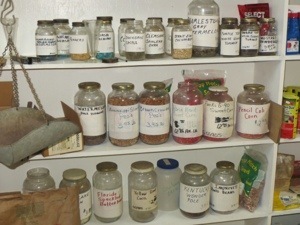 This general store handles the shopping needs of the local area, but is neatly organized – and the cheeseburgers and onion rings hit the spot. 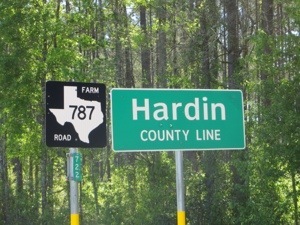 Earlier in the day, we entered Hardin County. 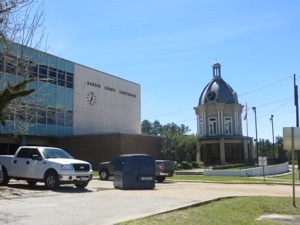 In Kountze near the end of the ride, we rode past the County Courthouse. 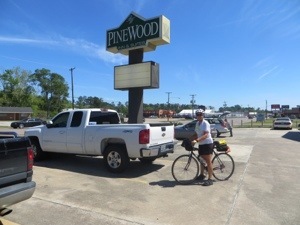 Just as I rode into the driveway of the Pinewood Inn in Silsbee, my bike computer turned to 2,000 miles. 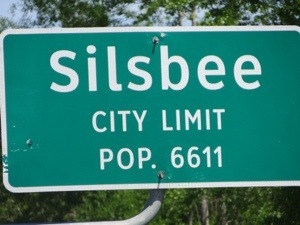 And tomorrow we leave Texas after 18 riding days and 3 days off! 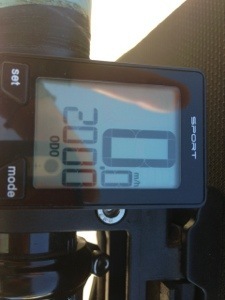 65 miles today; average 11.8 mph. We love hearing about your adventure. 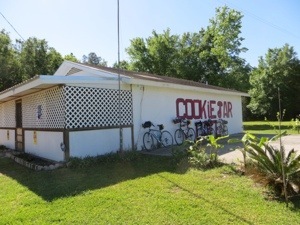 Happy riding to Florida.